Delicious served with sweet, jammy conserves or syrups. Or for a savoury treat, serve with dairy-free cheese, a cranberry and port preserve, or try with bacon, sausages and eggs. 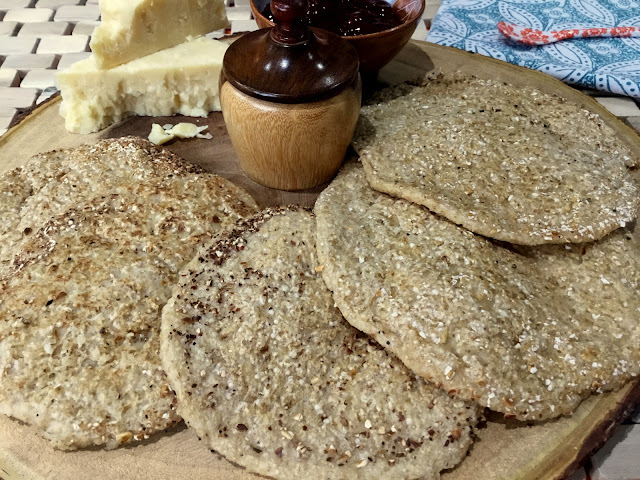 This gluten-free version of the ancient recipe from Yorkshire, makes a soft oatcake, not biscuit-style oatcakes. In a medium bowl, blend the warm water and yeast together. Add the oatmeal or oatbran and the salt and stir with a wooden spoon. Cover the bowl with a slightly damp cloth and leave to rise in a warm place for about 60-70 minutes. Heat the griddle and sprinkle with the extra oatmeal or oatbran. Gently stir your oatmeal batter and pour circles of it on to the griddle, gently helping it to spread out thinly with the back of a metal spoon. Cook for about 1 minute on each side, then place on a cooling rack or over a rolling pin covered with a cloth, to cool. Serve with sweet or savoury accompaniments for afternoon tea or a nutritious snack.